Success and failure on two blocks of SF’s Mission St. 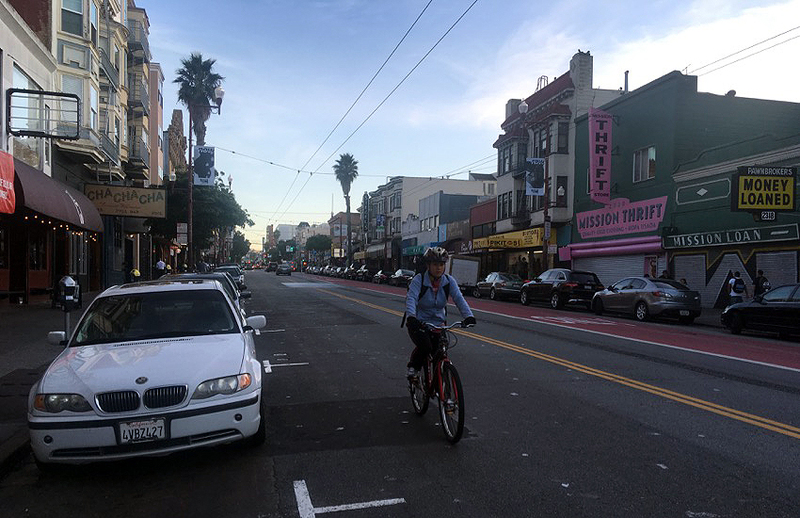 In the past year, Mission activists have turned their sights on Mission Street where they would like to see restrictions on market-rate housing, more commercial controls on bars and upscale restaurants, and protections for small businesses. The efforts are couched in language to “save” the Mission. However, after a look at the businesses on two blocks of Mission Street between 19th and 21st, it is unclear if many enterprises need to be saved. Those businesses that are doing poorly could use what many small businesses in the city need: rent relief, more customers and a return to a time when e-commerce did not exist. At the same time, interviews with 50 of some 57 businesses offer a complex story of who is succeeding and why. Slightly more than half — 29 — are doing well, and another 12 are doing fine. Nine said they are doing poorly, including three that will be closing in the near to immediate future. Three older businesses — La Taza, Pete’s BBQ and Mikes Groceries and Liquor — declined to comment for this story, but if full seats are any indication of prosperity, La Taza and Pete’s are doing very well. In four other cases — including the three cell phone providers, AT&T, MetroPCS and Cricket Wireless — no one in authority could be reached to speak to the issue of how business was doing, but again, their stores are generally full. One business, Barrel Proof, which replaces another bar, Cease and Desist, will open this weekend. Of the 47 businesses that reported doing “very well” to “well enough,” restaurants were the biggest group. And although activists would like to see fewer bars and restaurants, several owners said they would like to see more. Those businesses that are doing well cut across the divides of new and old businesses, and survive by attracting long-term and new residents as well as tourists passing through. Nearly all have had to adjust to an era of e-commerce, high rents and increases in the minimum wage. Businesses doing poorly seemed to be narrowly focused on serving a low-income clientele and had yet to attract newcomers. Some even talked about following their Latino clientele elsewhere, but figuring out exactly where that would be is not easy, because Latinos have moved to the East Bay, the Excelsior and beyond. Of the 57 or so businesses between 19th and 21st Street on Mission Street, 20 reported that they had been open five to 10 years, with 15 surviving for 30 years or more, and another 12 have been open between 10 and 30 years. Ten businesses are newer and have been open for five years or less. The low-end retail stores that are doing well are ones that generally appeal to a broad swath of the population. Vanessa Porras, who has worked at Pikitos, a clothing store, since it opened four years ago, said an influx of tourists and visitors has benefited their store. “Even though a lot of our customers aren’t community-based, it does help the community a lot,” she said. Nearly 80 percent of Pikitos’ customers are out-of-towners, but this jump in business allows the store to maintain low prices on brand-name clothes and a $1 rack that provides fresh clothing to many homeless people. Dore Photo Studio, one block up, has maintained a steady clientele for nearly 70 years. Mercy Padgett has worked at the studio for 23 years, and said the business relies on its legacy to survive. The grandmothers and mothers who took photos at the studio continue the tradition with their offspring, she said. And, like other long-time businesses, they have found clients among the newcomers. More recently, the studio switched to digital photography and began to do group photos for large companies like Yelp and Genentech. Business has slowed down a little in the last three years, Padgett said, but the changes help Dore’s maintain its spot in the Mission. Some smaller stores, however, are struggling, especially those that are aimed at the Latino customer. That decline has been well-documented. The 2010 U.S. Census shows that the Mission’s Latino population dropped to 48.1 percent from 58.8 percent in 2000. Based on a more recent estimate from the American Community Survey in 2016, the Hispanic population has dropped to 46.1 percent of the neighborhood’s population. 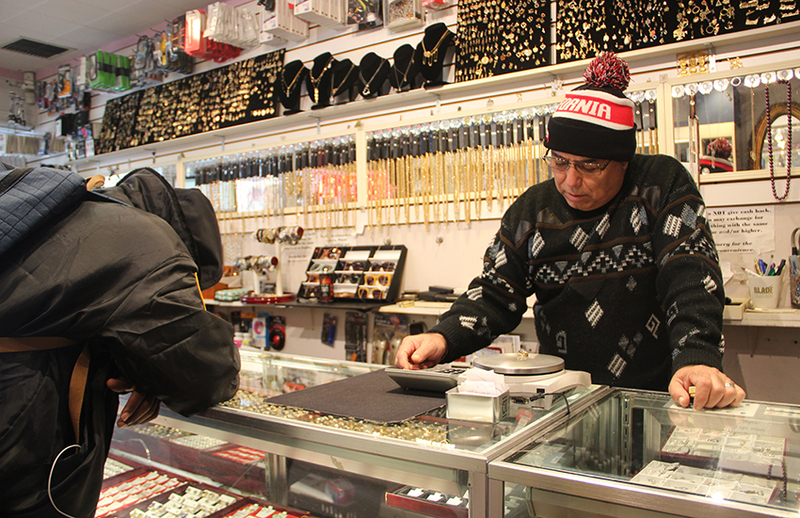 The continued exodus has been felt by small shops that cater to Latinos. Alberto’s Printing has been open for 40 years. Owners Martha A. Perez and Ruben Perez say they will stay in business until their children complete college in four years. What they are fighting is not only the convenience of e-commerce but a diminished client base. Additionally, owners said, the new fear of immigration raids have made some Latinos afraid to go out and about to shop. 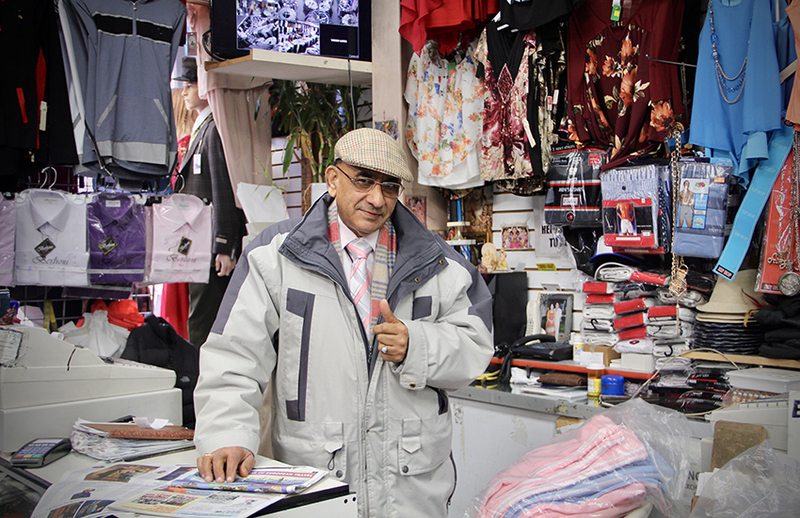 Narinder Anand, the 70-year-old owner of House of Jeans and Fashion Emporium on Mission Street, once owned 11 shops in the Mission District. His customers were primarily Latino, and he still relies on regulars to keep his 18-year-old business afloat. Narinder Anand (70) owner, House of Jeans. Photo by Supriya Yelimeli. La Quinta, a Mexican restaurant on 20th and Mission street, has also struggled. It opened seven years ago as Latinos were leaving. The shop owner’s 60-year-old mother, Sonia Janet, agreed that the immigration climate has hurt her business. What has saved them so far, she said, is that the business is owned, run and operated by family members. People who leave the neighborhood never return, and businesses can either close or change the way they operate, he said. The shoe store recently started advertising online and on Facebook, and employee Maribel Marquez, 28, said it helps a little. Marquez would like to follow the Latino population elsewhere, but he said it’s hard to define where to move, because there’s “not one place like the Mission” with a large population of working-class Latino people. Gilberto Garcia Rivera, moved into the space held for 70 years by Hellenic American Greek Imports eight years ago and kept its name. Two years ago, his rent increased to $5,000 a month. Selling knick-knacks, vintage goods and passport photos barely adds up to the $10,000 a month he needs to make. At the same time, as rents increased, he said, Muni’s bus-only lane reduced parking last February. His sales have dropped, and he will close his store in three months to seek employment somewhere else. More than anything, however, Rivera blames robberies — he has experienced four since he opened — for his decision to close. At 46, Rivera says he feels old. He has diabetes and says the stress is too much for him to handle. “I’m tired, I don’t want to do anything about my business anymore,” he said, adding that in his next job, he will be an employee rather than the boss. Mission Jewelry and Loan, at 2318 Mission St., which has been a fixture in the neighborhood for almost 50 years, will also close its doors within the next four months. The 77-year-old owner, Darryl Kaplan, was recently shot inside his store. The owner is recovering now, but Vic Pizarro III, a 37-year salesperson at the store, said the incident shook Kaplan and his family. While some small businesses are faltering, others have improvised ways to stay open. Several have combined two businesses into one space. Take Offtop, a hat store that shares a storefront with Modern Haircuts on 19th and Mission Street. It creates custom Bay Area Sports team caps that are a hit with tourists, according to 28-year-old owner Daniel Reyes. The store also does custom embroidery for business uniforms, and Reyes said he recently got a commission to create dozens of hats and polo T-Shirts for La Taza. Modern Haircuts has survived in the Mission for more than 10 years, and Reyes said hats and haircuts have worked well together to attract more customers. Seven-year-old mobile repair store Compupod, at 2433 Mission St., recently started delivering services at clients’ homes. 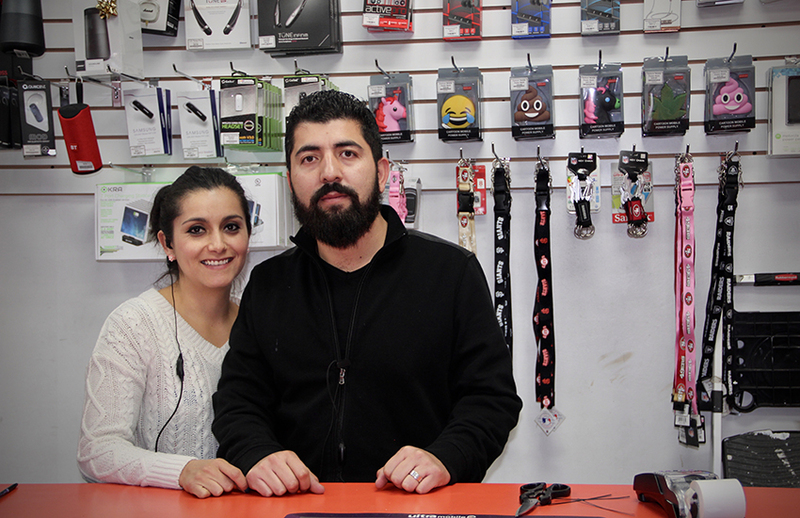 Hugo Gonzalez, the shop owner, also rents out a portion of his storefront to a laptop repair service. Yolanda (36) and Hugo Gonzales (33), owners of Compupod. Photo by Supriya Yelimeli. Across the street, Gonzalez’s father and uncle have owned Angie’s Jewelry for 15 years. The store began online sales last week, and the store continues to offer check cashing, and jewelry and watch repair. Ramon Gonzales (father of Hugo Gonzales, above, 62) at Angie’s. Photo by Supriya Yelimeli. Of the 10 restaurants and cafes in this two-block stretch, four are new and some, like Jim’s, have been in the neighborhood for years. Jim’s has been on Mission Street for 70 years. Some of the establishments suggested that the street needed more restaurants — not fewer, as some activists would like to see. Ok Un Kim, (59) owner of Jim’s. Photo by Supriya Yelimeli. One of those was Danny Garland, the bartender at Gashead Tavern. More bars will fuel business on Mission Street, he said. Patrons can then hop from one busy location to another and eat at hole-in-the-wall spots, instead of being diverted to Valencia Street. A Mission Street lined with bars, however, butts up against a moratorium on liquor licenses put into place to diminish the impact that too many bars can have on an area. Gashead’s revenue has been up and down since it opened four years ago, but Garland said a current upswing in customers gives him hope. He fears gentrification on Mission Street, like many other business owners, but said good service and quality will always keep customers coming back. Laundre and Lotus Indian, both new spots that opened up in the last three to four months, say business is thriving. Ariana Roviello, the owner of Laundre, said the cafe gets busier every day. Word of mouth is a big boost for her and the cafe has maintained high online rating. Mark Finein, the general manager at Myriad on 2491 Mission St., also said he relies on ratings to draw customers. Finein said restaurants need to be vigilant about quality if they want to keep their footing in a market like San Francisco. He said the Mission has reached a “critical mass” of cafes and lunch spots, but he said there is still room for more cocktail bars and dinner restaurants. When Andrea Fogelbach moved to San Francisco nearly 17 years ago, she was able to live in the Mission District with a rent of $450 a month. 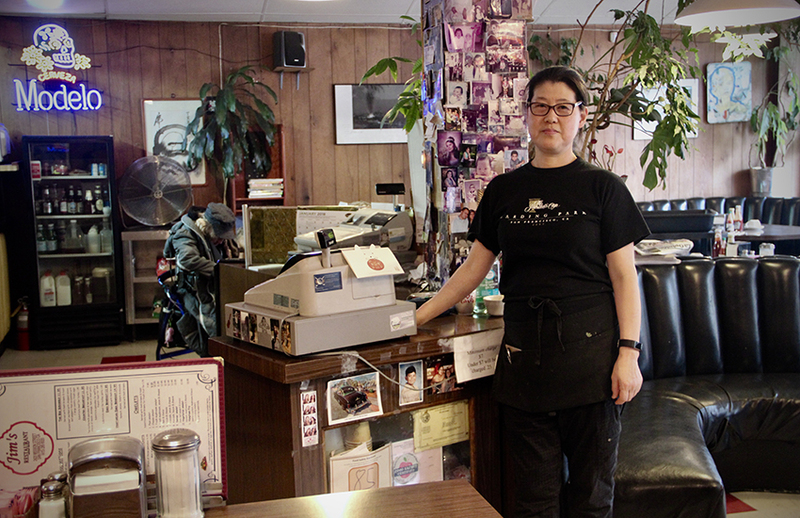 She opened up Mateo’s Taqueria two years ago near the intersection of 20th and Mission streets, and the restaurant has had to adapt quickly to retain employees. Mateo’s, which has a monthly rent of $4,500, has consistently paid above minimum wage to compete with other businesses, and Fogelbach insists that older shops will perform well if they keep an open mind and match the “activist history” of the neighborhood. This includes letting workers attend protests, and interacting with new business owners who want to positively serve the neighborhood. Fogelbach said that older businesses and restaurants have to be flexible, including paying higher wages to keep workers, creating simplified menus and catering to newcomers with bright, newly designed storefronts. She sees property thefts and robberies as something that comes with the territory. “No matter how many new businesses we have here, no matter how many changes, it’s still the Mission,” she said. Lydia Chávez and Stefania Rousselle contributed to this article. It’s ok to let businesses fail. Sure it’s sad in some cases, but sympathy has no place in a free open market. You either adapt, improve or fail. Hold all the “community” meetings you want, but people will either spend money for what you offer or they won’t. It’s fairly obvious at this point that retail is a losing battle moving forward, except within niche markets. People buy online, millennials are spending on experiences instead of ‘things’. Instead, we should be promoting entertainment and hospitality businesses: cafes, galleries, eateries, venues and bars. This is what other cities are embracing all over the world and it’s benefiting everyone. Think of the lost opportunity when you compare a, “cash only”, dollar store with 1 employee peddling absolute garbage to a busy cafe, employing several people raking in large taxable margins.